Breaking news in Glasgow's East End that Tam"The Licensee" McGraw has died of Natural Causes at around 3pm today (Monday 30 Jul 2007). The Glasgow gangland feud has taken another twist with the second stabbing in a fortnight of Tam McGraw, known as "The Licensee". McGraw is understood to have been knifed in the neck in the Rutherglen Road area of the Gorbals on Wednesday morning. There is no word on his condition. Strathclyde Police and the ambulance service say they have no report of the incident. McGraw has been locked in a bitter feud with Paul Ferris, whose parole was revoked last week after the pair were said to have been involved in a knife fight. On that occasion, McGraw initially denied anything had happened and declined to give police a statement. He is said to have been chased by two men, brought to the ground and stabbed in the neck back. He was wearing a bullet-proof vest to protect his chest. The two men ran off, leaving McGraw in a pool of blood. No hospital in Glasgow has reported treating a man resembling McGraw, but last week when one of his associates was also stabbed, he was taken out of the city for treatment under an alias. Ferris had served two-thirds of a seven-year sentence for gun-running before his release in January and is now expected to remain locked up until 2005. He was once an enforcer for the notorious Thompson crime family in Glasgow, but fell out with Arthur Thompson senior. 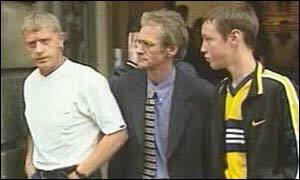 The emnity between the two men is also linked through Glasgow's complex underworld web to the recent stabbing of Thomas TC Campbell, one of two men convicted of the Ice Cream Wars murders. Campbell is currently on bail with his co-accused, Joe Steele, pending an appeal hearing. They were jailed for life for the murders of six members of the Doyle family, who died in a house fire in Ruchazie in 1984. McGraw is known as "The Licensee" because of his interests in the pub trade. He was licensed to commit murder and allow police to supply him drugs........get REAL! A jury has returned not proven verdicts in the case of a man who was accused of trying to shoot two other men in a pub in Glasgow. Ross Boyd, 21, of Nitshill Road, denied trying to murder John McCartney and Craig Devlin at the Royal Oak bar near his home. Mr McCartney, 42, told the High Court in Edinburgh that Mr Boyd was his cousin and would not hurt him. The two victims were taken to hospital by Tam McGraw, known as "The Licensee". 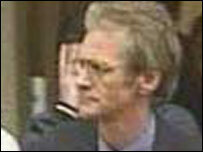 At the end of a week-long trial the jury took six hours before clearing Mr Boyd of attempted murder. The trial heard how two traffic police officers escorted Mr McGraw's vehicle to Glasgow's Southern General Hospital after he flagged them down. Many witnesses said they could not remember what happened at the pub, Mr McGraw was not called as a witness and all efforts to trace Mr Devlin had failed. McCartney said he could not remember anything about the shooting in February 2004. The trial heard how drinkers panicked and dived for cover as shots rang out. Mr McCartney, a council driver, from Barrhead, Glasgow, was treated after being shot in the buttocks. The court heard that as he lay in intensive care waiting for an operation, he told police: "I don't know what happened to me. I don't want to tell you anything. I just want you to go away." Giving evidence, Mr McCartney said he could not even remember speaking to police. He was Scotland's underworld equivalent of the Teflon Don. According to gangland mythology, he was a man who was licensed to commit crime anywhere and at any time. However, in one of the greatest ironies of gangland history, Tam "The Licensee" McGraw has died, not by the sword, but from natural causes. From humble beginnings in the east end of Glasgow and a life of petty crime and gang fights, McGraw graduated to armed robbery. Before long, he went on to forge a fierce reputation and a considerable fortune which some say could have been as much as £20m. With a criminal empire which extended from legitimate activities such as taxi firms and security companies to extortion and drugs, he became one of Glasgow's more infamous figures. According to Paul Ferris, another figure from Glasgow's organised crime scene who claims to have gone straight, McGraw was a police informant. This was a charge that was always strenuously denied by Strathclyde Police. In his autobiography, Ferris claimed that McGraw was backed by corrupt police officers and received confiscated drugs which he then sold on the streets. Many of his criminal colleagues would have preferred McGraw to stay permanently at his homes in Tenerife or Ireland. Indeed, five years ago, he was stabbed in broad daylight not far from his house in Carrick Drive in the Mount Vernon area. He suffered only minor injuries because he was wearing a bullet-proof vest. His reputation grew as a Glaswegian untouchable. McGraw name was linked to the infamous Ice Cream Wars in the city, which involved the murder of six members of the Doyle family, who died in a house fire in Ruchazie in 1984. He was never convicted of any wrongdoing, with not proven verdicts delivered after attempted prosecutions for drug smuggling in 1998 and the attempted murder of a policeman 20 years earlier. Like Al Capone who was eventually jailed for tax evasion, The Licensee, unlike many of his contemporaries, managed to dodge the assassin's bullet, only to die of natural causes. don't think so some how, didn't take much to do with him whenhe wiz alive. Frits take over, Ha ha Ha. Now for all the "no he didn't die of a heart attack, it was a hit", Blah Blah. Oh by the way, They are all singing in Barlanark New Tam McGraw Songs now, No Joke! Do you know the words of the song newsman? Wee Monty hasandalways will runthe show in Bar-l , keeps his heed doon, best way. shettlestonbhoy, do you know mabig mate Frank MacIntosh? "People should not live in fear of their governments,the governments should live in fear of the people"
"The more i learn about people,the more i love my dog!" Bada bing bada gone, f**K the ratto! Hi Shettlestonebhoy, welcome to F.C.